6:43:00 PM Just found and tamed one this afternoon. I have been looking for very long time. The baby was with 5-6 adults just on the upper rim of the northern plateau due north from Smuggler's Outpost. -726 3088. 4:40:00 PM Got mine the other day, after spending about 2.5 hours wandering around Endor. I had done a wide circle around the Smugglers Outpost, diseased from a Merek. Being rather depressed, I started walking back, and saw some yellow dots, so I tabbed thru them. LO and Behold! There it was. Put on my BE clothes, had some almonds, and tamed him on the second try. 2:43:00 AM i spent all day looking for one of these guys and as i decided to go back to the smugglers and give up i got off my bike did an animal area track and there it was by pure luck. I killed the first adult, the second incapped me and my pet killed it and the third spawn was a baby. Im on the farstar server and it was about 1500m nw of smugglers post. 9:43:00 AM Yes, but I usualy walk alone when hunting for a baby. So the baby doesn't attack my pet. Thats why I was looking for a red circle. 4:08:00 PM While I was out looking for a baby gurreck a few days ago, I was looking for a yellow dot and a red circle around it. (The new Con, not sure of the full name, thing near the mini map is useful at times, it shows how hard the animal or NPC is to you.) But I found an adult gurreck with a yellow dot and a yellow circle. That was kind of odd to me because once I killed it and got another adult, that one was yellow dot and red circle. Anyway I did find the baby that day which was cool, but if you are using the Con thing just be careful because you may pass the pet you are looking for. 5:33:00 AM Yeah, I got lucky, too. First time, I found one just nw of smug outpost about 20mins after servers came up. Just now, I found a spawn of gurrecks in the same area, and have gotten no less than FOUR babies. Unfortunately, I accidentally killed one, so I only tamed 3... to add to my one that's already an adult. If anyone wants one, contact Ravenne on Valcyn. I'll trade. 12:37:00 PM I was out just NW of Smuggler outpost yesterday looking for one of these guys. Found a static spawn of 2 of them. I started to kill both of them and 2 more popped up. I killed both of them and a baby spawned on my first night hunting for them. Guess I am lucky took about 20 minutes. 6:29:00 PM Send a tell to Chen-Wai Lam. 3:10:00 PM If anybody is on Intrepid one my Gurrecks needs a home. Adoption fee is 50K. 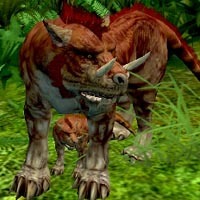 10:08:00 PM I was able to tame two of these on Intrepid @ -1653 3246. 2:18:00 PM Wrix and Gurreck look the same. 4:22:00 PM Does the Light Armor on the regular gurrecks give it overall better resists than the Prowling Gurrecks 65% kin and energy? 2:07:00 AM tamed 2 from a pretty large spawn. I gotta say I pretty impressed! 11:36:00 PM No lairs. A friend and I found two babies at -2235 3092 on Test Center. (Each server seems to have at least slightly different spawn points so be sure to post your server when you post a sighting). 11:36:00 AM I don't think they're that rare. When I was looking for a Prowling Gurreck (which I still haven't found by the way) I've come across about 6 Gurreck babies. That's in only 1 weeks time frame too. Of course rarity might be server based too. I'm on Scylla. 4:51:00 PM I gave up Master CH before the patch, but now I'm a master again. Can anyone confirm if the gurreck has light armor? I've heard different things from people. Personally, I have not come across one yet since the patch, so I was just wondering.